We make replacement convex glass for all the old shapes and sizes for the old frames circa 1900. The chart below lists the common shapes / sizes, but there are other shapes we make such as the double boiler with semi circular shaped ends, and a few other smaller rectangle and cathedral sizes. For strength, we use 3mm (1/8") thickness glass when making these. Flyer here . . .
Convex glass from subtle to moderate depths can be made in custom size rectangles & squares, standard oval sizes, any diameter circle, or custom sizes & shapes. Depth is generally relative to size of glass. It is commonly used for 3D picture framing of textiles, general memorabilia, and can be silvered to make convex mirror glass, in both traditional and contemporary styles. 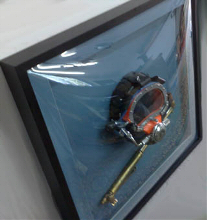 Deep convex glass is very handy for picture framing of bulkier 3D items. We have a range of standard sized rectangles, squares, ovals, and circles to suit most project needs. We also make deep style convex glass for our reproduction portrait frames in the range of 6 frame shapes / sizes. 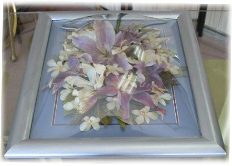 See our Photo gallery page for more examples of framed items using these 3 types of convex glass . . .